Successfully Added Wireless Presentation Laser Pointer + USB Receiver to your Shopping Cart. Improve your presentation skills ten fold with this wireless presentation page scroller with red laser. Using radio frequency technology, you can finally move about freely around the presentation room. This is a simple plug & play presentation gadget. The G189 emits a powerful Class II red laser that makes an immediate impact upon the important points you wish to point out. 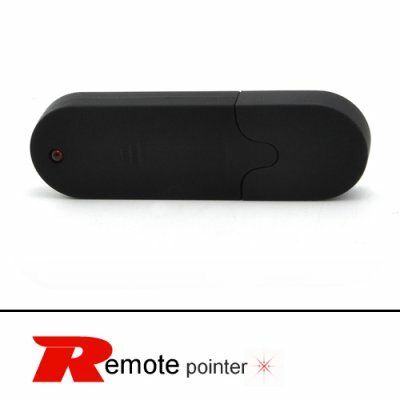 This wireless presentation tool consists of a handheld laser pointer/mouse for controlling Microsoft Office and internet pages and a USB dongle receiver. How does it work? Simple, press the page up or down buttons for convenient control over your presentation, and at the same time point out important details with the long range powerful built in laser, that’s it. This cool looking presentation laser pointer with page scroll feature is suitable for teachers, professors, lecturers, doctors, engineers and people working in sales that need to impress clients. Click "Add to Cart" now and we will express ship you a sample to see how great this presentation gadget truly is. The G189 is available for single and bulk purchase orders straight from the leaders in consumer electronic gadgets, Chinavasion. Improves your presentation, by allowing you to move freely around the room. Do I need to install any drivers for this presentation laser pen to work? No, this is a plug and play Wireless Remote Control Presentation Laser Pointer + Receiver, it works straight out of the box. Is this an Infrared or Radio frequency based trasmition? The USB dongle and the wireless presentation laser communicate via radio frequency, so you are not affected by any objects while freely performing presentations.